The best price we offer! Your credit card is charged only $39.75 per quarter. This saves you $141 off the yearly price of $300. Continue as long as you like and stop, if you choose, whenever you like. Subscribe today and receive your free Welcome Briefing Package that contains the six-page report, Chaostan, The Full Story. This package is revealing, stimulating and thought provoking. 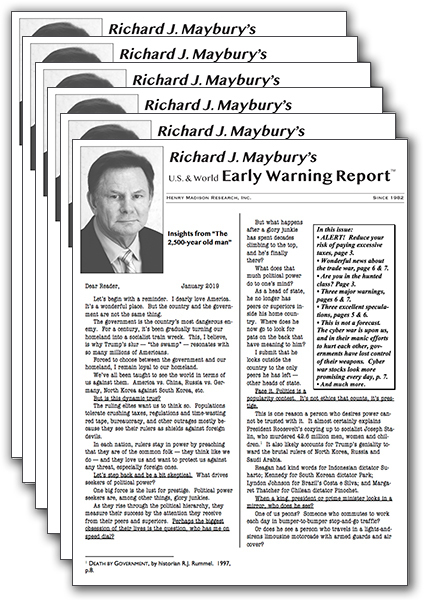 Early Warning Report is published 10 times per year. In the US, you will receive both postal mail and electronic delivery. Non-US subscribers will receive their EWR via electronic delivery only. If you have any questions regarding a subscription please don't hesitate to contact customer service at 800-509-5400 or 602-870-9329.